Intrepid education reporter, Linda Lutton (and also the mother of a child who went through the High School process this year) has tracked down all kinds of data that I’ve been dying to see. We can now get a look at the % of kids who apply and are accepted to each SEHS. There’s the % of kids in the top SEHS who come from private schools. I’m curious to see if anyone is surprised by these numbers. Here’s the story and some charts below. Thank you to reader “Y” for sending the link. Y, how about some info on the Lane meeting?? Does the Private School “% admitted” refer to the percent of the incoming class that comes from private schools, or does it mean the percent of the private school applicants that gained admission? Those private school numbers are higher than I would expect, but they do help explain the ratcheting up of competition. For the other stats, it does seem that the Tier 4 kids heavily dominate getting the rank spots at the top schools. Reinforces what we already know — fierce competition in Tier 4, leading to kids with very high scores being shut out of the top schools. Don’t think it makes for any special insight into the bigger policy question of whether there should be more, less or same amount of SE slots. Same questions exist — for these bright kids shut out of top SE schools, do they funnel into improving neighborhood schools and other options, or do you carve out more SE spots and let the neighborhood schools continue on their current course of lackluster performance (and by “lackluster”, I’m being generous). Interesting story. Interesting data. Brings to mind many questions but I’ll start here. The article discusses a school close to United Center with the “challenge to get into top 4 schools” claims 825 as a high score with no acceptances. A tier 1 or 2 student would easily get in with an 825. So….are we talking problems with tier classification or are these higher scoring students also higher income. Why does the issue always come down to these top 4 schools. I see Lane and Lindblom on the top schools list. What about the top 6? OK. I clicked through the link and got the answer to my question. Wow — the high percent of kids in SE high schools from private schools is pretty surprising. What are the main driving reasons so many kids in private grade schools switch to public high schools? –Lack of private school options or tough admission to private high schools? For us it comes down to 1 word: College. We have been paying tuition at a great Catholic school for 11 years. Just can’t see how we could pay $10,000+ for another 4 AND save for college tuition. Plus we don’t mind getting a piece of our tax investment back with going to CPS after all this time. Many private and parochial schools end at 8th grade. Private high schools cost more than many private elementary schools. Does the tier system really produce socioeconomic diversity in the schools, or is just a shell game through which the more advantaged students living in all tiers get to take up the lion share of the spots? I think there are a probably many people who are afraid of the answer to that question. The article also included a Google map that is marked with colored dots showing which CPS schools sent what number of kids to those Elite 4 SEHS: zero kids (yellow), one to ten kids (green), and 10 or more kids to those 4 schools (blue). There is actually a good amount of dispersion in the green dots throughout the city going to Jones, WY, Payton and NS, while blue dots are found more in the North of the city. So can we get a 25 point bonus for kids who attend cps elementary? I’m just a parent who volunteers, but I know that Jones has 55% of its current students who receive free or reduced lunch. Friends of Jones was asked for money last year to provide CTA money and winter coats for some of the students. Kids there come from every social, cultural, and religious tier one can define. At NSCP, where my other child attends, the percent of free or reduced lunch eligibility is, I think, around 30%. The religious and language diversity at NSCP was a pleasant surprise for my dd. I think the article was disingenuous to leave Lane (and the other SE’s) out of the equation. While depressing for those of us who didn’t get magnet placements, the data isn’t really surprising. When my daughter didn’t get into a magnet I made the decision NOT to buy the house we had been looking at so we’d be more mobile if needed. At first my mother was aghast, she now fully sees the wisdom in the decision, because it seems that is what will be happening. t makes me sad and angry, but really, it isn’t a choice because, as many have noted, the real issue isn’t that there are so few selective enrollment slots; the issue is that there are not OTHER acceptable alternatives. Wow, look at all those Super 4s (the truly affluent) taking spots away from the working middle class. Those 1%ers are at it again! I agree with Lakeview dad. 4 years of public high school allows a parent who has been paying for private elementary a chance to save for college. It would be faulty to assume that parents in private elementary schools have the means to pay property taxes, give their children a K-12 private education and save for college too. Plus, as JKR wrote some of these schools end at 8th grade anyway. As a side note, not subjecting our kids to the assessment and sorting regime that accompanies trying to get into the selective elementary schools was a huge reason we chose private. Some kids are just late bloomers and that obvious fact shouldn’t, but does, keep some kids from getting a quality 1-8 education in Chicago. However, by 7th grade early differences tend to even out. I believe what you are seeing in these admissions, apart from socioeconomic considerations, is that by 7th grade more kids are able to reach the kind of educational benchmarks that can be assessed by a standardized test. Some of the kids who weren’t reading 1-2 years above grade level earlier have caught up (for example). The private/public angle, while interesting, only serves to distract people from the fact there aren’t enough SEHS spaces for the very “top” students in each Chicago school (let’s say the top 3-5%). This is important because there is a lot of development that happens in students between 7th – 12th grade. If we can’t even nurture growth in the kids who look poised to do the best then I don’t know what the hell we think we are doing. Well, I do know. We’re failing kids—the best test-takers, the late bloomers and the kids who never got a fair shake to begin with. The statistics in this story are interesting, but it detracts from the real issue with CPS — not enough spots in “good schools” or not enough “good schools”. That is what media should really be making noise about. We send our children to a private school. Our CPS neighborhood school wasn’t strong enough when our kids started school. One of my children scored in the 98th percentile on the CPS gifted exam for elem school. He did not get in. We were Tier 3 at the time. He is not the only one with a high score who didn’t get in. And our CPS alternatives weren’t good. Consequence… we’re at a parochial school. So, yes, I would like my kids to have a spot at a CPS high school. But, if they don’t score an 895 — or whatever insane number is necessary to get a Tier 4 kid in — what are their other options at CPS? What are the options for that kid with the 825? Regardless of who is populating CPS SE schools, what’s really not fair is that there are just not enough good schools to serve the needs. What are the percentages of public school kids who opt for private high school? Look, mom — a troll! I am hoping you are joking. Under the cities tier 4 guideline of $71,000 income in a house that is hardly affluent. A family of 5 that owns a house, pays property taxes etc is hardly affluent. I think the cut off for tier 4 in reality should have bee $100k plus. I guess the troll snagged you. Sorry, I tried to warn. FYI, the cutoff between tier 4 and tier three is not intended to be some sort of definition of “affluent”. There is a formula that applies to all tiers — tier 4 simply means top 25% in the six factors that determine tiers. Article on the Lake View High School meeting in case fellow obsessors want to start pushing everyone to go to Lake View. It really does sound great! I would say that a very small number of public school kids switch to private high school because there are far fewer spots for private hs than private elementary. There are fewer overall spots for two reasons: many private schools stop at 8th grade and those that have a high school enroll their own students/feeder school students with a smaller number of new admits. The benefit of private high school admissions is that academic scholarships are available. In elementary I see much more need-based support going on. A private high school might be a great option for a kid who does well in a smaller school environment. Let me explain my seemingly trollish behavior. I have stated on another thread the opinion that there needs to be an additional tier that distinguishes between the truly affluent (“Super 4s”) and the rest of tier 4 which is comprised of mostly working middle class families. The bungalow dwellers in my ‘hood have little in common – socioeconomic and otherwise – with the swells that live on the Gold Coast and send their kids to Francis Parker. I guess my attempt at humor really missed the mark. Too soon for levity about the SEHS process? 19 – Most catholic private high schools offer scholarship money, as needed. Yes, the yearly tuition is 3x or 4x what the grammar schools cost. The take-away from this data should be that private schools do a better job than public of preparing their students to get into SEHSs. It has nothing to do with access (as the actual story implied). They are not given preference (the opposite, in fact, if you look at the test score that were shown in the other CPS obsessed articles). They simply test higher and, therefore, get more of the “pure merit” slots. If you are upset because private schools are better than public schools (and wealthy parents are willing to pay for that quality while also paying for public schools via property taxes), then you should either work to improve public schools or support a voucher system that allows all students to attend private schools. The fault here is not with the private schools or the parents who send their children to them but rather on the CPS elementary schools. stop fretting about the SEHS’s and start working on your neighborhood high school. It only looks bad because all our kids aren’t going there. As the article says above, someone has to be pioneers for the first year. @20 Mayfair Dad – your commentary actually works as a great litmus test to show who’s been on this site for a while and who has joined since their kid got their letter. And actually, a troll is “a member of an internet forum who continually harangues and harasses others. Someone with nothing worthwhile to add to a certain conversation, but rather continually threadjacks or changes the subject, as well as thinks every member of the forum is talking about them and only them. Trolls often go by multiple names to circumvent getting banned.” Not one bit of that definition applies to Mayfair Dad. I may not always agree with his position, but he’s always good for an interesting discussion with some humor to boot! And at least he signs his name. I’m going to go start making my Occupy GoldCoast signs now. I’ll have a FB link for the group page as soon as I’m done setting it up! I don’t get this statement. Everyone has the same right to public education. Just because someone decided to opt out for elementary school doesn’t mean they forfeit their high school right. This sentiment that if someone can afford private school, they somehow are less entitled to public school seats – seems common on this site. . . . but its just wrong. Not everyone in private school is wealthy. And just because someone is wealthy, doesn’t mean they don’t have the same right to public education. I think statements like this are divisive and encourage misplaced anger towards private school kids and wealthy folks. Also, I’m getting a little tired of the “I’m Tier 4, but I’m not as affluent as other Tier 4 families – so I should not be lumped into this category.” The tiers were not designed to punish wealthy – it is to try to give a leg-up to truly disadvantaged people. We can argue about whether it accomplishes that. . . but just because you are not as wealthy as the parker and latin families in tier 4 does not mean you are disadvantaged. I’m not wealthy or in private school – just getting a little sick of all this whining. While I am not particularly surprised to see that the north side SEHS’s have a disproportionate number of tier 4 kids, I am sort of disappointed that apparently having a 39-41% lock on admissions over the rest of the tiers is not enough. My solutions (predictably enough) are: consider the south side SEHS’s – many are accessible by Metra or certainly by carpool. They are also excellent schools but easier to get into (remember, just one year ago, many, many tier 4’s were turning up their noses at the idea of Lane (the gangs! the smoking! the drugs! the size!) but this year are willing to sell a kidney to assure that their kid got into the very same school). In my experience, southsiders frequently come north for many things, including schools, last time I checked, Lakeshore Drive and 90/94 run both ways. Explore the many, many wonderful IB, Magnet or even neighborhood high schools on the northside. If you don’t like them now – get involved and make them better. And enjoy taht you don’t live in a Tier 1 neighborhood. Amen, brother. When my kids were applying to Kindergarten, there were fewer quality CPS options for elementary school than there are now. We tried to avail ourselves of what was available, both test-in and lottery options. But we didn’t get in. Our neighborhood CPS elementary school was, at the time, not an option. So, rather than leave the city, we paid to send our kids to a local, modestly priced, private elementary school. And for all these years, I not only paid tuition, I paid my property taxes to support CPS so others’ kids could get educated. Come high school time, you bet I will now try to get my kids into the public system — to which they have exactly the same right as any kid who was lucky enough as a five-year-old to win a school lottery. “Swooped in to take spots?” You cannot be serious. The notion that I should be further penalized by giving current CPS kids a bonus of 25 points in the SE HS admissions game is offensive. Yes, my private elementary school prepared my kids well to be admitted to these SE high schools. Sorry if someone else’s private or public elementary school didn’t. But I am a Chicago resident, and if I can finally get some benefit from all my tax dollars flowing to CPS for all these years, I will take it and enjoy it. I don’t feel even a little bit guilty about that. I think the data shows that the tiers are working exactly as designed. The numbers skew toward Tiers 3 and 4 because of rank admittance. That allows Tier 4 to snag 34.5% of all selective enrollment seats and upwards of 40% for the top 5 high schools. Tier 3 overall is 25.7%. With Tiers 1 and 2 at 19.9% each. After seeing this data, I say leave the system alone. And I really couldn’t care less how many private school kids get in. To me that is a non-issue. I was just telling a friend that the second part of my quote was not included in the written story. After saying that some parents resent the private school kids getting so many spots (which some parents do) I said that private school parents could make the argument that they have more right to those seats given that they’ve paid taxes but not used the schools for 9 years. And of course the final point is that none of that matters because it’s about being a city resident and nothing else. everyone has their own story. my child went to private preschool, different private kindergarden and 1st grade (no so good btw), switched to CPS 2nd grade through graduation. The (OH MY GOD B in 7th GRADE) was enough for us to look around with an open mind. Student is in private school now and loving it. Yes, the tuition is costly, but (OH MY GOD A “B”) set the tone for that. Thank God for options. Let’s be careful with the logic being employed here. The argument seems to be that private school students have a better chance of getting into a selective enrollment high school BECAUSE they went to private school. That’s not necessarily the case. There are dozens of other factors which contrubute. Children at private schools may have parents that are more engaged at home, they may have private tutors, they may have really smart parents, they may have had classical music played to them in the crib. Saying that private school CAUSED them to gain admittance to a SEHS is no more factual than saying wearing a uniform CAUSED them to gain admittance. Don’t give up on CPS. I’ve been on both sides of the elementary fence with my kid’s education. Started with CPS, moved to private. CPS is getting it right in a lot of schools and so are the kids and the families. Take credit where credit is due I say. There needs to be discussions with CPS about this HS situation, though, that they created. Good points — was just going to write the same. Let’s also not forget that the top private schools are also selective enrollment, so they frequently have a choice of the top students. @ 30. Some of those families looked at what the cost of living in the suburbs would be vs. private school tuition and chose to stay the city and send their kids to private school. For many that meant both parents working full time and even holding multiple jobs, all the while paying taxes to support CPS. The fact that private schools do a better job preparing kids for the most coveted SEHS seats is a testimony to their commitment and hard work. I don’t begrudge them. Are we chumps for putting our faith in CPS? Some days it sure feels that way. “Saying that private school CAUSED them to gain admittance to a SEHS is no more factual than saying wearing a uniform CAUSED them to gain admittance.” Bingo! @cpsobsessed – If you feel that your kids are developing their intellect and, moreover, becoming lifelong learners in CPS not only are you not a chump but you are one of the extremely lucky ones!! Thankfully I can say this about my private school too but it does come at great expense. Ironically, the best funded elementary schools have better facilities and resources than my private school! Is there data available breaking down how many of the 36 kids from Bell were in the gifted program? I imagine all of them? I am surprised by the rate of acceptance of private school kids. I’ve always been intimidated by the thought of my kid competing with RGC and classical school elementary kids who work 1 to 2 grades ahead, and get weekend homework in the primary grades. I’ve wondered if our private was really up to par with that. I wonder what the rate of acceptance is for the RGC/Classical kids. We do NOT work out of a math textbook 1 year ahead of grade level. It’s hard to explain other than pride. I want to live in Chicago. I hate it when someone from Naperville says they live in Chicago. No. You don’t. I do. And I’m proud that my kids go to the public schools. Maybe it’s my small way of saying, see everyone, the city still works and I’m working to make it even better. But, Mayfair Dad, some days I do feel like a chump. From red light cameras to special city taxes to tiers to no place to park. But I’m a Chicagoan. And I sure as hell can’t leave now and miss seeing the Cubs finally win the World Series. 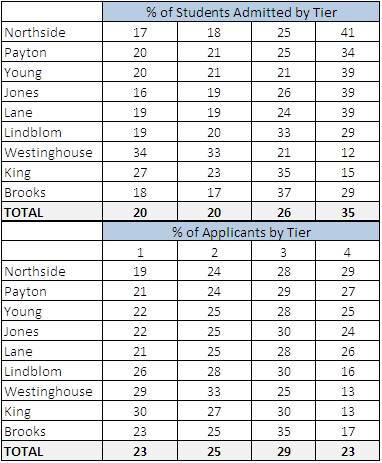 I find it interesting that according to the chart the highest % overall of applications to the schools they identified come from kids in tier 3 (almost 29%), yet kids in tier 4 end up with the highest percentage of seats. My issue with the tiers is that you have situations where one side of the street is tier 2 and the other side is tier 3, and I’m shocked that there are 0 tier one tracts north of Belmont this year (except a very small section in Uptown). But overall, going through the numbers, I have to admit that the system does a better job then I had felt reading the hundreds of postings that I’ve read here. @32 MeLastYr – this is one of the worst problems with the system as it is today. To get into SEHS from an upper tier you need to be perfect as a child.Perfect. All A, high ISAT, high selective test, you cannot have an “off” day. I wouldn’t have gotten into a selective if I had to run that gauntlet – back in my district it was mostly test based but, that meant there were enough options for people. My cousins who (more easily than I) qualified for our version of selective enrollment chose to go to a classical school instead, because it was a great option. If there were fine options for all kids who wanted them the frenzy over SEHS would greatly subside. @18 – thanks for posting the Lakeview article. It alleviated my top fear (no 21 year olds with 14 year olds!). Now I just need to move 2 blocks south. @29 After seeing this data, I say leave the system alone. Pardon my hesitancy. Because the numbers show that tier 4 gets the lions share of offers, this now makes tiers OK? The same problems exist – consistency, accuracy and fairness. The 825’s at the local school that can’t get in. The numbers now show that kids are coming from the selective, private and better schools so the myth that tiers enable the kid that “does well in spite of their educational challenges” still exists. Tiers still allow unjustifiable leaps through the ranking to determine offers. I still wonder how these numbers compare to rank or some majority rank version. Looking at the numbers again, I bet that the % of private school kids enrolled at Lane, et al will be higher for this coming 2012-13 year. (this is last year’s data). I know several ex-private school kids attending Lane already, but their numbers must be too small to protect their privacy by listing. I’d like to see the first tier year’s numbers too…The percentages must have been even higher for tier 3&4 since the BRC felt that the criteria had to be changed for last year. @ 39 — I think there are 31 kids in Bell’s 8th grade RGC class — so some of those 36 spots are definitely filled by kids in the neighborhood program (and probably more than just 5). In my experience, there are many high achieving kids in Bell’s neighborhood program (in fact, I know quite a few families that have turned down RGC/Classical offers at other schools to keep their kids at Bell in the neighborhood program). I’d guess those who feel the most resentment toward private school kids “taking” precious seats in SEHSs are those who took the chance on a failing or up-and-coming elementary school. I think those folks, for better or worse, feel a bit proprietary toward CPS and maybe even feel like a spot in a SEHS would be a fair reward for the chance they took and the work they put into bringing their school up to par. Just an observation. @ 44: the data does shoot a few holes through my “let diversity happen organically” argument. Even with aggressive, overt policies to control Tier 4 enrollment, the scales still tilt in their favor. I like what you said about living in Chicago pantherparent – and I totally agree (though I’m not looking forward to the “speeding” cameras or the longer school day). Remember that there is a selection bias with regards to the high percentage of successful applicants coming out of the private schools. It is possible that only the best private school students are applying for the SEHS schools–there are plenty of very mediocre private students who would stand no chance at getting into one of the top 4 schools. Those students typically don’t even try. – Wonder if any measurable number of home-schooled kids are included in the private school numbers? – The number of private secondary school seats is probably much, much lower than the number of private elementary students, making the 30% enrollment not that huge of a surprise. – Would be interesting to see how these numbers have changed over the years. Is this really just a blip from the recession/housing starting in 2008? Or has it just become more fashionable among the guys smoking Cuban cigars around the yacht club to say, “my kid’s at Payton” as opposed to Lab or Parker? – Interesting article, but it’s unfortunately destined to be catnip to those who want to drop the % coming in by merit even lower than it is. – didn’t see whining about this in briefly scanned comments above, but something tells me private schools with teachers lacking the protection of CTU are probably a little less inclined to dish out 7th grade Bs to their $19/k paying customers than their job-for-life peers in CPS. Add this to the “pick the highest standardized test score” advantage, and perhaps we’ll get to a more rational, uniform admission basis. – What wasn’t mentioned (possibly to make the article slightly less inflammatory) was that certainly some of the privates are coming in from lower tiers. It’s actually a little surprising that Payton’s Tier 4 population is only 34% – if all the rankers and PDs came from 4, then we’d see a total of about 55% from tier 4. I’m sorry – I totally disagree with the concept that “private schools better prepare kids for high school”. The people who are able to afford these schools are often (not always) well-educated themselves, value education, and solidly middle to upper middle class. Both of my children (who are now in public schools and have been for years) started in private schools, one Catholic one a well-regarded small private program, and I can assure you that in both cases the families were like most of us on this site, valuing education and putting the time and effort into our kids education. The quality of my children’s public school education is just as good if not better than their private school education – socioeconomic status is a much better predictor of how likely they are to get in than private v. public (as evidenced by the disproportionate Tier 4 numbers). As an aside, went to Northside’s Introductory meeting this week – love the Principal – and was really struck by the apparent diversity in the kids/families that were there. I’m still laughing about “organic diversity”. But doesn’t this prove that with the 40% tier 4 seats, diversity is achievable? How is say 80% rank with 20% ability/need applicants different from what we have? I’m guessing pretty close with a much more palatable degree of accuracy and fairness. Still comes down to supply. Conversion of Lakeview to selective anyone? @18 even the LV article emphasizes “neighborhood” enrollment. Oh well, just another scheme. A bit disheartening to see folks reaching for the same 4 schools feeling left out. I tell you, marketing is everything. Rarely see an advocate for this here, but one solution that is lacking in Chicago are reasonably priced, great private schools. Not sure what the barrier to entry as a provider are these days and in this city, The demand is there, the opportunities are there for technological efficiency, high-paid “rock star” teachers, creative admissions criteria. Price point is probably $3K-$6K per year. Not sure why it’s not happening. How would a school that charges $6k a year pay the teacher well and keep the school running? I don’t think it’s feasible, although I agree with you. I think the city could support several more privates at even 10k a year. 56 – that’s the challenge, one that only a free-market can solve. I’d suggest that there’s no reason a high school that attracts and admits hard-working, disciplined and adequately prepared students can’t be more like a university, with 50-75 kids in a lecture class run by a 150K/yr rockstar teacher, aided by lower-paid (and even more attentive) tutors and state-of-the-art technology. But this hasn’t happened yet, so maybe there are forces preventing this. My kids have gone to both catholic school and the good local public school. I would have to say that the public school actually gave more homework and had consistently stronger teachers. The big difference was in the students and families. It was much easier to get to know families at the catholic school because the parents were around. I think both were good experiences for my kids. @55/56: What you are describing does exist. My son goes to St. Matthias in Lincoln Square. I think tuition for next year is just over $5K. About 30% of our students are there on scholarship. Sibling discount is deep (I think 3 kids costs about $11K). And it is unique in that it provides individualization and project-based learning within a Catholic school. I want to say that last year, 4 or 5 kids from the graduating class got into Northside. Other high school admissions were strong (Lane, St. Ignatius, etc.). I really don’t know why more schools like St. Matthias don’t exist. Even at $5K per year, St. Matthias still provides lots of extra-curriculars (2 days of gym per week, music, art, library, computer, Spanish) and laptops for all the 6th graders and up. So, it is possible to run a quality school without charging an arm and a leg for tuition. Also, the majority of kids from St. Matthias end up going to public high schools. This is because: 1. Private high schools cost a lot more than St. Matthias and 2. Proximity. When you have been walking your kid down the street to school for 9 years, the commute to Loyola or St. Ignatius every day is kind of a hard pill to swallow. I do know that Amundsen is the neighborhood high school for a lot of STM families, and they are really interested in its revival after being sickened by all the high school admissions news this year. @52 – Your bullet “…private schools with teachers lacking the protection of CTU are probably a little less inclined to dish out 7th grade Bs to their $19/k paying customers…” is a little presumptuous. In our case we rode our Catholic school student HARD to get those A’s, not the teachers. And those A’s were on an A=92% scale, and with 2 accelerated curriculum courses. Our 7th graders A’s weren’t given, they were hard earned. Many Catholic parish schools are in the 5-6k range. And people assume they are subsidized by the archdiocese, but it’s not true. The weekly collection at mass subsidizes the tuition. And the teachers, whose salaries are shockingly low. Yeah, I thought they got paid pretty little, but do it “for the church.”. Which would be hard to replicate without the religious component. I don’t think the teacher at our ex-private school (11k range) were making all that much. But I also have to figure the stress level is lower than it is in cps, so there must be some appeal there. I think that the reason the private school numbers are so high is because you have a large pool of private school applications due to the large number of private schools. It’s not one entity, it’s many different entities across the city all funneling into the application process. I’d be interested to know the actual percentage of private school applicants who received SEHS acceptances vs. public school. Certainly parents who sacrifice (in many situations) and send their kids to private school are the parents who are invested in their education, no matter what the tier, so that also narrows the pool to those students who have the most significant factor of academic success. I’d like to know the percentage of RGC/Classical school applicants who received acceptances. I’d wager it’s higher than private school applicants. Then the nonRGC parents can complain that their kids HS fate is determined by a 20 minute test at ITT when they’re 5. How did the WBEZ person get CPS to release this data? Just call up and ask? Why did they agree? Wow, can anyone do that? I’d love to see the actual stats on that. But it would be much more helpful if this article had included all the selective enrollment schools (plus Lincoln park). ChicagoGawker – whoops, sorry, I just re-read the piece. I guess they meant their little list of elementary schools which includes a few magnets with the RGC/classicals. Strangely though, Decatur is not on that list, unless I just missed it. I’d think they would send a lot of their kids to Northside. 67 – Decatur only has students up through grade 6; at one time (pre-SEHS) this meant they would naturally progress off to WY AC; not sure where they head most nowadays…. 60 – You’re right, it was presumptuous. Should have drawn a distinction between religious schools (which pre-date public education by what…a millennium or two?) and secular schools (FWP, Lab, Latin) although both are “private”. Would still need to see hard data on grade distributions to know whether the “high-priced privates” were buckling — honestly, they might have perverse incentives to grade kids harder in order to lock them in for another 80 grand for high school. 67,68-Most Decatur graduates have gone on to AC’s, primarily WY and Taft. The ones at WYAC usually stay there for high school. I noticed Taft AC was at the top of this list. Probably a lot of kids who used to go to Decatur. This year’s Taft AC 8th grade class had an unusually high number of Decatur kids because Decatur had a double class that year. In my experience, having a son in that class, the Decatur kids (and I don’t know who else) did arrive with a strong desire not to stay at Taft for high school – a desire that spread quickly to many other students. I don’t know if other students arrive with this agenda but I does seem like the program really operates more like a feeder program to the SEHS’s -while at Whitney, many (if not most) of the AC kids choose to stay at Whitney, at Taft, it seems like the cool thing to do is to try and leave for choicer grounds. On the other hand, many kids from the Taft AC program apparently were not accepted to the Taft IB program this year (at least according to my son -take with major grain of salt) -so maybe this will change the AC student’s perspective a little. I thought the IB high school program sounded great personally. Some curiosities about the WBEZ feeder school spreadsheet. I’m guessing that to be a “feeder school” on this thing, you had to have at least one student go to one of the 4 mentioned SEHS. I’m only equipped to comparatively analyze Payton, being in possession of its directory that has backcover tidbits like “the class of 2015 came from 101 elementary schools” – so since the spreadsheet says there were 77 public feeders, I’ll conclude there were 24 private feeders. For all the talk about revitalizing the neighborhood school, the poster child school for that, Nettlehorst, seems to have sent no students to the Fab4…this might be because the revitalization (i.e. resegregation) of Nettlehorst might be less than 8 years old? Hard to keep track. yikes – I take that back ! Nettlehorst did have some asterisks in the spreadsheet, good for them! So I guess if we did it all on rank it might fall like this. OR we might run out of Tier 4 kids so that might be a little lower than 57%? @76: Yeah, that is pretty good about Nettelhorst. I want to say that the first group there to revitalize the school would have kids in 6-7th grade tops. At my neighborhood school, once there was a new principal and the bar was sort of set higher by her and the parents, the test scores in the older grades improved as well which was encouraging. Regarding the WBEZ story, I *think* Linda may have started with a FOIA but then CPS was forthcoming with extra info once that started. When I talked to them last week they seemed willing to share more Tier info. Yes, I was “outted” in the story, but I have been in other media as well so I figured I’d go with it. Of course after last week’s insanity I now wonder if some crazy parent might come track me down. I’m realizing that I (we) need to brace every year for the onslaught of readers who come to the site during high school and elem letter week every year. It feels crazy, then most people disappear once they get the information they need. Typically there are 1500-2000 visits per day. High school letter week this year was the biggest day ever with over 16,000 visits. But as we see… it all calms back down again. Until elementary week at the end of the month. Regarding Bell’s placement, if I look at Edison (typically one of the top scoring schools) they placed 19 kids. If you assume the Bell gifted class did the same, that means they placed 17 kids from the neighborhood program. Compared to Burley which place 12. So close. Bell may have more classes than Burley for 8th grade. Not sure but I think it shows that Bell’s neighborhood program would probably look pretty good on its own. Anecodotely, the previous Bell principal told us in a tour that they might move a child from gifted to neighborhood in the last couple years if they think that might improve their chances of getting into an SE high school. 🙂 I love it when such is noticed. A fuller picture. Excellent idea! I’m so impressed what a mom/dad doing a Google search can learn now, but just think if she/he had data and information through FOIA. I read that the parents attending the Longer Day forum on Thursday had data that blew away the CPS presentation and Harvard-trained executive. With FOIA, the catch is that school systems often claim FERPA protection of that data. However, data can be delivered in a way that protects student privacy (to the limited extent covered by law) — despite what a school district might claim. BTW, “directory” data is not protected by FERPA. @52 regarding private schools being less, the same or more inclined to give A’s in 7th grade. Who really knows, right? But one way to look at it could be that private schools partly attract kids based on how many get into SEHS, right? So it could be that there is even MORE pressure to give A’s because if a private doesn’t send enough kids to SEHS, people won’t choose them. Or less, who knows. There is absolutely no way to measure it. My guess is there is probably similar percentages of teachers and schools in private and public giving easy A’s and similar amounts really making their kids earn it. 77 – I must have missed the original post about this “tier app”…so what is this? I did some rough calculations to try to do the same thing based on the “% admitted by Tier” table above – the % of the rankers from each tier will vary (wildly) from school to school. The negative numbers show where the formula falls apart, but also highlight oddities in the raw data. For example, ignoring PD or assuming it’s equally allocated to the tiers, every tier should have AT LEAST 17% (i.e. 1/4 x 70%) but somehow Westinghouse only has 12% Tier 4s. @ 80 — Does Bell’s gifted program have just one class per grade (like Edison)? Your son was right in at least one case. A friend of mine has a child at Taft AC. He was torn between Taft IB and a SEHS until he didn’t even get admitted to Taft IB. So off to Northside he goes. @85 – nice number crunching, thanks! My guess on the negative numbers would be that schools with round 2 offers were not bound to extend 2nd offers by tier. If these figures are based upon acceptances, a smart tier 1 kid getting scholarships to Ignatius, Latin, Parker may turn down the Fab 4 (love that name). So rank skews heavily toward tier 4 in northside predominately tier 4 neighborhoods (surprise!). The brightest tier 1 and 2 kids chose Payton and Whitney (another surprise). Tier classifications do not correlate to the racial demographics for a particular school with the exception of Payton (surprise again). 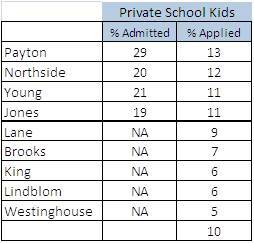 Payton stands out as the only school that captures the most diversity along with the brightest kids (genuine surprise). I wonder what the tier changes for this year are doing to the mix. Since the private schools don’t utilize the ISATs, does anyone know how the scores are calculated? I know that take the Terranova test. what would the %’s look like by tier if they only accepted top scorers with no regard to affluence/tiers? How skewed would the acceptances be toward Tier 4 for the SE HSs? @ 92 – I’m bad at math, but I’m guessing… ‘very skewed’. I think Payton’s more centralized location gives it the ability to be the most diverse – it is easily accessible for many different types of populations. . Interesting to see that Blaine sent fewer than 10 to the top SEHS, given that it’s been gentrified longer than, say, Nettelhorst. Nice to see a good showing from Disney (though it’s a huge school, with about five classes per grade, it’s still close to 65% low-income). I really wish they had included Lane in the chart. It was number 7 in the state in the middle of the North side of the city. Many kids put that down as their first choice as you can see by their top scores being 900. The stats would have told us quite a bit including adding more schools like Nettlehorst and Blaine on the chart. How many more from Hawthorne or Lasalle would have made it if Lane and maybe LPIB or HH were on the chart? A few weeks ago, we linked to a chart listing which CPS schools the freshmen class of 2010-2011 at various high schools graduated. Some of you may not have seen it, so I’m posting the link again below. Since the data I got was all the way down to 2 kids and up (vs. 10 kids or more), it may be of interest to you, even though it’s one year old. We include Lane, LP, Lake View, and von Steuben. If an elementary only sent 1 student or none to the high school, then the elementary school is not on the chart. @97 – Thank you so much for that chart. I did miss that in the past. That is very helpful. A sample FOIA letter is available on the BGA web site. Let’s take a step back. Why have the tier system at all? How about we assign spots in SE schools to the students with the best scores, period. I believe that the WBEZ story is pretty emblematic of what’s wrong about CPS and public education in America, at least on one account. The tone was one of “the rich get more than their fair share, once again, using their money to take places deserving minority and working-class kids deserve”. Why isn’t the issue/quasi-scandal about why so many fewer CPS kids from certain neighborhood schools not scoring and achieving well enough to get into The Top Four? The glaring fact that kids from Tier 1 and 2 neighborhoods already have it so much easier (over 100 points in the case of NS) is all but ignored for sake of this story. People ignore the glaring problem of the achievement gap and act like the real issue is middle-class/upper-middle class kids (especially white and asian ones) simple taking more than their fair share through some unscrupulous use of their money and privilege, not that so many kids in Chicago are receiving a crappy education. Simply presenting the disparate outcome as the result of “screwing” poor kids for benefit of rich kids allows the education system to pass blame of some “other” issue than the most obvious: poor and working-class kids in CPS are not being educated well. Also, take it from me, “private” almost more often than not means “parochial” in Chicago. Parochial schools spent roughly 50% or maybe less per student (stating salaries for teachers is a mere $26k/year) and serve many/mostly kids from “regular” income families and frequently those from low and working-class neighborhoods. The WBEZ story made it seem like the typical “private” school in Chicago is City Day or Sacred Heart, etc. (i.e., places where tuition really is around $20k or more in some cases), which is most certainly not the case. What I would like to know is what percentage of spots were assigned to kids from regular public neighborhood schools, not classical, not gifted and not magnet. Is that data available? Am I reading it right – does all the data in the WBEZ article relate to prior years? How long before CPS releases data for this year’s admission process? True. Also being ignored to a high degree is the role that SES of the poor and working class play in education outcomes. It’s not just the “bad teachers” or “failing schools” — how about the bad societal, etc., factors? Can’t be ignored, but it is in how education reporting is framed. @ 100. Thank you. Class warfare over the few SEHS crumbs when the real story is how many children are being falied by this dysfunctioning school system. So if I am reading this correclty, the kids at Decatur then get the spots in the Taft AC program, instead of the capable neighborhood kids, and then get their top choice of high schools. What a crock! Sounds like their luck just keeps improving. They don’t “get” the spots. They earn them with their scores, combined with the tier system to level the playing field. Right, my point is that not every kid gets a Decatur education, follwed by an AC education followed by a SEHS education. It was the first step that helped them get the second and then the third. Chicago has made it so that if you don’t get step one, the others are unattainable. As a parent of a former Decatur student, I can tell you that normally approximately half of a graduating class at Decatur ends up at Taft and the other half at WYAC, with the occassional student choosing private or RGC. That means that about 11 or 12 Taft AC spots, out of 120, are filled by Decatur students (every few years Decatur has a double class graduate so the numbers are a bit higher, maybe 20). And, as cpsobsessed noted, they test and apply just like everyone else. @CJ: well, that is sorta true, I’ll give you that. I think there are now some good neighborhood options (and perhaps charters) but in the past it was like the high school system — you get in a SE or magnet or you get crap. We all know there are way more kids in the city who could work at the gifted/classical cps curriculum level than there are seats. The effort lies in pushing the neighborhood schools to do so. Clearly the magnets seem to be. Now Lane has a new AC, so that should mix it up a bit. While Decatur is a great school, I suspect the kids who go there would probably get in even if they didn’t go to Decatur. While the school might make the kid, the kid also makes the school. Given the number of kids coming from neighborhood schools into the AC Centers, I think there is a fair chance that if you are a good tester and get good grades you’ll get in somewhere. The key is to be the kind of intelligent that tests well… very well. For what it’s worth, my son bombed the Decatur test for kindergarten and still made it to an AC center. There are no gurantees which means that things might not go your way – but then again, they might. Great point. We’ve said this over and over on thos blog, but people forget the obvious point: a school where kids have to test in the top 1-2% to get in are going to have great ISATs even if the actual “school” is not all THAT. One could put those kids in a dim basement and they’d still do well on the ISAT, relatively speaking. Also, I’m so tired of hearing: “All HSs should be as good as NS or WPCP!”. Well, yes, obviously. However, CPS has to educate the kids it has, not the kids it wants. There simply aren’t enough kids in CPS that will score 28-30+ on the ACT (especially considering that with the achievement gap and all, the average CPS student is 1-3 years behind before HS and the average freshman at NS or WP is probably 1-3 years AHEAD. NS and WP actually get less $ per student than some/many other CPS HSs that average 13 or 14 on the ACT (because of Title I, etc. ), but there will always be “haters” that insist NS and WP are somehow getting some special treatment from CPS. Is this really news? If it is, you should read up on current American education more often. What next? People will discover that kids in the ghetto aren’t getting as many top scores on the ISAT or ACT as kids in Lake Forest! It’s a scandal! The tests are obviously made to benefit rich white kids over poor black kids, right? It can’t possibly be that poor black kids really are shockingly way behind upper-middle class white kids, academically. The rich white kids are “taking” the good scores away from the poor black kids in Lawndale! OK, not a perfect analogy, I know, but this is how it seems at times. It’s easier to gripe about the OVERachievement of certain groups as “unfair” than deal with the UNDERachievement of certain other groups in an effective way that will actually have the greatest benefit. I say this as a parent of black children. In the same way “All colleges should be as good as Harvard or the University of Chicago”. However, there simply aren’t enough kids that get 32+ on the ACT (minimum), graduate in the top 1% (at a regular public school) or top 5-10% (at Lab, Latin, or a St. Grottlesex-type prep school or New Trier or Northside-type public school) of their class, plus are super-human leaders, extracurricular achievers, etc. Does that mean Harvard or the University of Chicago are bastions of “unfairness”? Or are they bastions of academic excellence born of necessary exclusivity in in order to maintain high academic standards, given that they have way, way, WAY more qualified applicants than freshman spaces. Again, I KNOW the college vs K12 public education analogy is glaringly imperfect, but people should get my point. The same point can be made about public colleges (UI-UC vs. Northeastern Illinois, etc.). This reminds me of what Evanston did when faced with a performance gap between certain groups — it eliminated the honors classes hoping that would lump everyone closer together in the middle rather than trying to bring up the underperformers. You can somewhat reverse engineer it (for 10-11) from HSO’s linked chart @97. Bell, even assuming every options kid got into a Top-4 + Lane (*not* a safe assumption) sent 30 from neighborhood, plus 16 LPIB/HH + Von Stueben (which might have included some options kids) so, 46 total, or about 2/3s (or more–don’t recall size of 2010 class) of the neighborhood kids going to Top-4 + Lane + Von + LPIB/HH (ignoring any that may have gone to WY AC after 6th, which I’d bet a fin was non-zero). @116 Chris, I already did the reverse engineering for many, although not all, the schools. Although our daughter was admitted to Decatur and Skinner, we opted for a private school closer to our home to: 1) spare her the long commute; 2) give her a religious education and 3) provide her with a more intimate learning environment. Out of the 45 kids in her 8th grade – all applied for SEHS. About 17 were admitted to Payton, 2 wanted Northside; 8 children were admitted to WY (5 enrolled) and 2 went to Lane. The reasons why Payton was so sought was it was a great school with no price tag and it was located close to where folks lived. Most of the other kids of the class went to Latin or Parker. About a third of the children from this school wanted a public school education to provide diversity – real world experience for their children. All of us could afford to send our kids to a private school for high school. I can say that this elementary school worked a good year ahead of the public school curriculum. In addition, those I know who went to the WY academic center did so with the express reason of avoiding the SEHS year. Unless a child is really unhappy with WY AC, there is little motivation to change for high school. Kids make friends, form bonds with teachers, learn familiarity with the school, so there is little motivation to change. My daughter could have gone to IB (Lincoln Park), Lab School, or Latin but chose WY and is thrilled that she is there because of the diversity of classes, the sports and diversity of the student body. Many private students have opted to come to WY. Oh, BTW, can we start a “CollegeObsessed” blog, because as a freshman, we need to start planning now! There is one! Can’t recall the name but MayFair Dad says it takes obsession to a whole new level. @90 — they take the Stanfords and the percentages are ranked the same in 7th grade. @118 Lawmom, I’m dying of curiosity to know what school this is. If you feel you can, email me at mwmairead@gmail.com and spill the beans. @124. Put two and two together: the private religious school is Anshe Emet. That was my guess…..unless lawmom emails me and denies. Just needs another column for “estimated SEES grads” to then rough out the attendance area kids getting into those HS’s from those Elems. And somehow figure out how many of the WYAC kids came from each school. And the breakdown of LP-hood, vs LP-other for the LP attendance area schools (mainly Lincoln & Ogden), andandand. So 45 spots for Tier 4 and how many neighborhood schools do you think fall into that tier? @127 and 128 — correct. Thanks for the college blogs. Do you by any chance have updated data for private school kids? These charts are from 5 years ago, I was wondering if switching to a uniform testing changed anything. Let me see what I can get with an FOIA. The previous data was pulled as a special favor from someone who worked at CPS who is no longer there.